Rocksteady Studios considered writing a new character in the Batman universe for Arkham City. With a wealth of interesting and evocative characters already inhabiting Gotham City through the comic books, it might seem a bit silly to throw in some new faces just for a videogame. On the other hand, Harley Quinn was originally introduced in Batman: The Animated Series in the early 90s before eventually being adopted into the greater DC universe by appearing in the comics. Rocksteady Studios accomplished what other game designers couldn't by delivering a game that felt distinctly Batman-ey in Arkham Asylum, so it might follow that enough trust was there for the writers to create a brand new character for the bigger and better sequel - Arkham City. "My idea was just 'Let's make a new character!'" said Rocksteady's spokesman Dax Ginn. "I really wanted to. That's something I was talking about really early on in [the design process] but it never happened for whatever reason." Ginn was in some ways spoiled by the amazing villains already available to dramatize. "Working so close to DC Comics means a lot of things - more than anything else it means you've got an amazing access into the archive and knowledge of these characters. So, what have we announced so far; Joker, Harley, Catwoman, Two-Face, Zsaz, Riddler, Hugo Strange, Calendar Man. I don't know how much more you'd want." Even without a brand new character, everything that I hear about Arkham City gets better and better. For one thing, there will be no loading between outside areas. "It's all open, all the time. Our technical director was like, 'What? You want an open-world that's open all the time that's five times bigger than anything we've done before? Are you crazy?'" Good for us that the designers ignored the naysaying of their tech team. 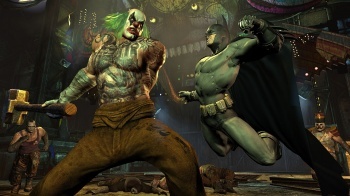 "[Arkham City] streams seamlessly throughout and that has been a massive, massive challenge." Batman: Arkham City is due out on October 18, 2011 for the Xbox 360, PS3 and PC.